Where in the world game: A very engaging game which will help you brush up your geography skills. It basically shows a zoomed in portion of a map along with four options from which you have to select the correct one. Aerial Imagery: Aerial imagery gives you rotatable, high-resolution overhead imagery presented in a new perspective. As of now there are only certain areas on the map which have this option enabled. Rotatable Maps: This lets you rotate the maps such that the southern hemisphere is placed on upper part of the map and vice versa. There are other features also like Latitude and Longitude marker among others. All the features may not work in all areas of Google Maps, as this is relatively new feature. 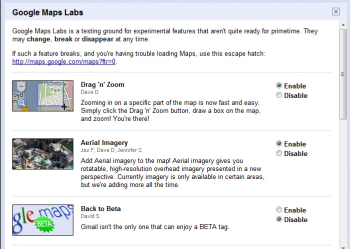 But with the Labs addition to Google Maps, you can look forward to some engaging developments on Maps.